All glories to Sri Guru and Sri Gauranga. All glories to our Divine Master, Srila Bhakti Sundar Govinda-Dev Goswami Maharaj. I would like to offer my respectful obeisances to Srila Bhakti Nirmal Acharya who was named by Srila Bhakti Sundar Govinda-Dev Goswami Maharaj as his successor as the President Sevaite Acharya of Sri Chaitanya Saraswat Math. I would also like to offer my respectful obeisances to Srila Bhakti Kusam Ashram Maharaj who Srila Bhakti Sundar Govinda-Dev Goswami Maharaj named as the Acharya of Mexico. I would also like to take this opportunity to offer my respects to all the devotees who over the many years since Srila Govinda Maharaj’s departure, have tried and continue to try to assist Srila Acharya Maharaj in his service to our Sri Chaitanya Saraswat Math. Many sincere devotees from around the world have inquired about the current situation at our Math in Sri Nabadwip Dham. Srila Ashram Maharaj is in Kolkata now and I have spoken to him several times and under his guidance have prepared this brief report on the current situation. Srila Acharya Maharaj left the Sri Chaitanya Saraswat Math in Sri Nabadwip Dham because the opposition group took over most of the facilities of our Sri Nabadwip Mula Math. At that time, there were 5 or 6 Nabadwip policemen present and they did not oppose the actions of the opposition group. The opposition group broke the locks on the Centennial Hall and replaced them with their own locks. They closed the entrance gate to the Math and locked it so no one could enter or exit without their approval. Because of this situation, this year the Sri Janmastami celebration was not held. Previously the Centennial Hall was where Srila Acharya Maharaj would conduct all the programs while the opposition group would conduct their programs in the Nath mandir. To provide some harmony at the Math, this compromise had been going on for many years. Now, the opposition group stated that there would no longer be two groups having separate programs at our Math. Instead they insisted that for now on, they would lead the programs and both groups should attend these functions under their direction. The police allowed these people to dictate these terms and refused to intervene. After Srila Acharya Maharaj left Nabadwip, he received news that the opposition group had forced themselves into his quarters. We do not know what the condition of those facilities are at this time. The local police are corrupt and have stood by and allowed this to happen in spite of Srila Acharya Maharaj presenting in the past numerous legal documents substantiating his position as the legal guardian to all the Math properties. Recently, Srila Acharya Maharaj met with an important IAS officer in Kolkata and through him a meeting was arranged with Mr. Sumit Gupta the District Magistrate of Nadia. In India, the district magistrate (DM) is the highest administrative position in the district. As such, the chief of police for the towns like Nabadwip report to him. Srila Acharya Maharaj and Srila Ashram Maharaj then met with the DM in Krishnanagar. The meeting was short but Srila Acharya Maharaj had brought a letter listing the opposition persons and clearly explaining the situation. He also explained that the Nabadwip police did not do anything to prevent the actions of the opposition group. Srila Acharya Maharaj also explained that when he himself spoke with the police they explained that he would need to speak with their boss, the chief of police of Nabadwip and convince him. They were just following his orders. Srila Acharya Maharaj told the DM that because of these actions, Srila Acharya Maharaj and the devotees could not make the necessary preparations and arrangements to celebrate the Janmastami festival. After reading the letter, the DM expressed his anger that the Nabadwip police were acting in this way. He said he would take some action. At the request of the DM, Srila Acharya Maharaj then sent the same letter to the chief of police of Nabadwip. Since then, the DM has been in communication with Srila Acharya Maharaj to see if the chief of police has taken any action, which he has not. Corruption is rampant among the local police. However, there is some hope that the DM will stop the police from continuing to support the opposition. The opposition group is now divided into two groups and they are fighting with each other. The first group is led by Ranjit, Nandan Swami (who’s brahmacari name at the time of Srila Sridhar Maharaj was Nimai Sundar) and Giri Maharaj (who’s brahmacari name was Gaur Krishna). The second group is led by Mahadev and Parmahamsa with devotees like Bipul, Vishvarup, Bhudev and Yadu Gopal. Srila Acharya Maharaj and Srila Ashram Maharaj recently met with some of the second opposition group at the office of Mr. Sawo in Kolkata. 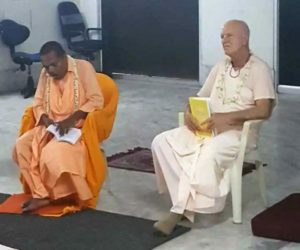 In the meeting, this second group complained bitterly against the first group and assured Srila Acharya Maharaj that from now on they will join him to fight against Ranjit & Nandan Swami. In spite of everything that has happened, with the assistance of devotees all over the world, Srila Acharya Maharaj continues to financially support and maintain the facilities in Sri Nabadwip Dham and the other centers all over India. Srila Acharya Maharaj has repeatedly demonstrated his dedication to the service given to him by Srila Govinda Maharaj and in spite of so much trouble that has come to him, he is determined to never give up that service. The method of making online donations through PayPal and credits cards are secure and functioning. Those funds are deposited into the Soquel Seva Ashram’s bank account and then sent to Srila Acharya Maharaj in a secure method. We are praying to Srila Govinda Maharaj that we may assist in some way although we feel helpless besides our offering of moral and financial support to Srila Acharya Maharaj. I will try to write more as the situation develops and more news becomes available.